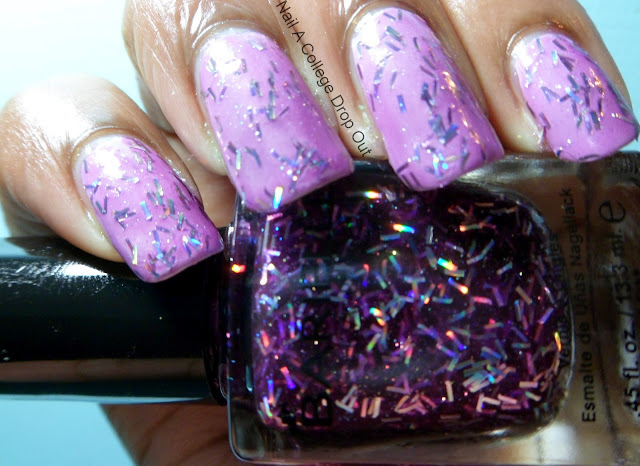 Nail A College Drop Out: Swatch-fest ...with Barielle! I recently got my well manicured hands on some pretty little Barielle polishes. And here they are! This one has kind of a "dusty" quality to it that was hard to capture. Think Icing J'Adore, but only blue-r.
Barielle describes this as a lime green with silver glitter. While this shade of green doesn't scream lime, it is pretty and how can you pass up any polish with holographic glitter? This is what I consider a golden honey mustard yellow with a hint of shimmer. This is definitely my favorite of the group! This is another one that was kinda hard to capture properly, but purples always seem to be. Shannon's Attitude is a tad darker then photographed above. All Barielle Shades are formaldehyde free, toluene free, DBP free, and pregnancy safe. They can be purchased directly from Barielle.com for $8 a bottle, but if you act fast you can get free shipping today only AND buy 1 get 1 50% off. Unfortunately I can't think of a witty closing line for this post. My Oral Communications professor would've probably had my head ...oh well! So pretty! Love that bar glitter!